In 1999 Sue Katz and Lisa Thurman took a longtime friendship to the next level as business partners when they founded AmazingCosmetics. With a shared passion for makeup the pair had always felt that a woman's complexion should not just be treated in the skin care process but with her cosmetics as well. They agreed that with a perfect canvas, every woman can go without much else and still look flawless. So when they found themselves constantly disappointed by their concealers, a complexion necessity, they decided to combine their business sense and makeup knowledge and pioneer their own brand starting with the AmazingConcealer. Little could Sue and Lisa know that their online startup company would grow to change the faces of women around the world and the face of cosmetics forever. Anti-Aging Face Primer is an oil-free primer that leaves your face perfectly prepped for makeup application. Anti-Aging Face Primer eliminates any uneven texture while simultaneously hydrating the skin. The primer leaves skin looking radiant without synthetic dyes, parabens and sulfates. Anti-Aging Face Primer uses Cassia Angustifolia, an all natural ingredient which hydrates your skin for up to a full 24 hours. 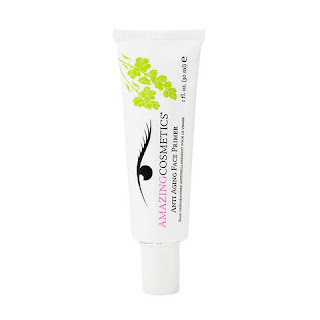 Its lightweight moisturizing technology is safe for all skin types and allows makeup to stay put all day long. I love AmazingCosmetic's Anti-Aging Face Primer! This is a wonderful face primer and I love that it fills in my pores and makes my foundation look smooth and flawless. I also love that it contains no synthetic dyes, parabens or sulfates. AmazingCosmetic's Anti-Aging Face Primer moisturizes my skin and eliminates any uneven texture. I found that my skin looked radiant and my fine lines were less noticeable. This is a wonderful product and I highly recommend it! Follow AmazingCosmetics on social media!